If you love lemons and garlic, then you will love this recipe. It is quite easy to make and, when done in the Dutch oven or French oven , the chicken comes out ultra tender. 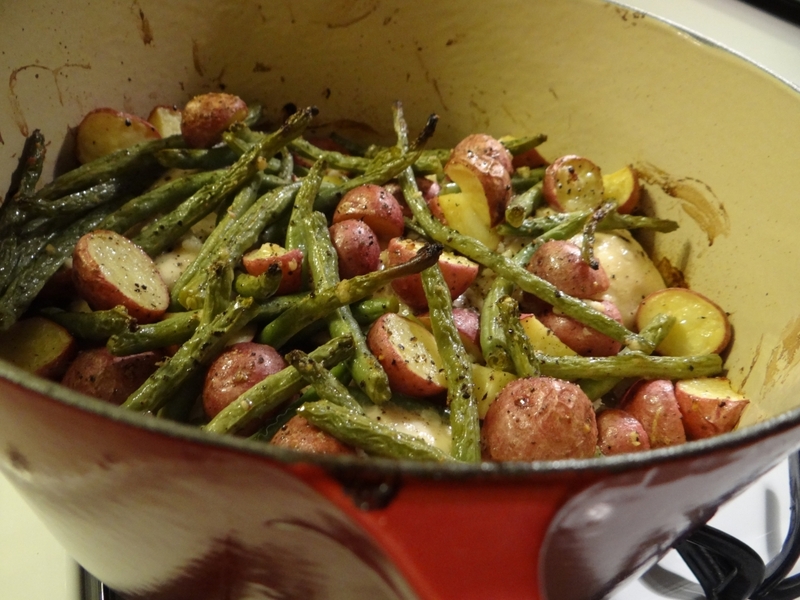 However, you can make this in any baking dish or roasting pan. 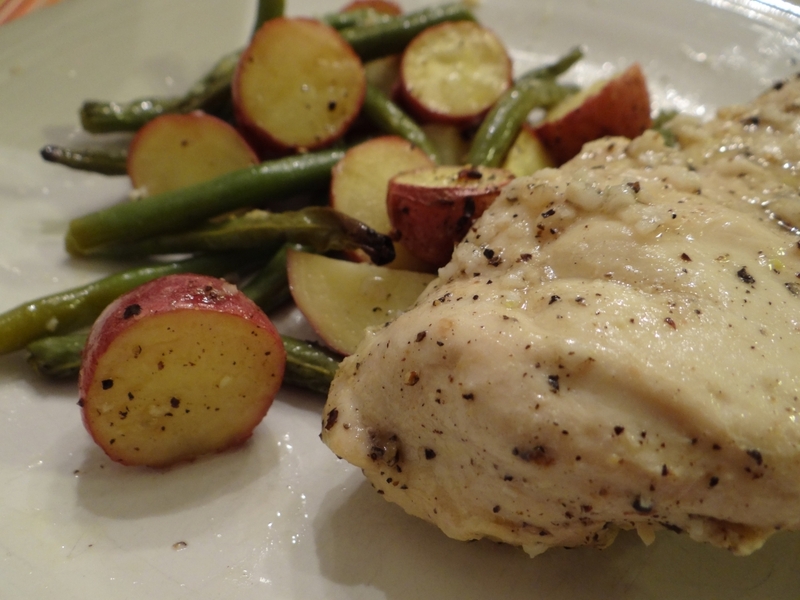 You start out with some chicken breasts, garlic, red potatoes, and green beans. These are all tossed with olive oil and salt and pepper in a bowl. 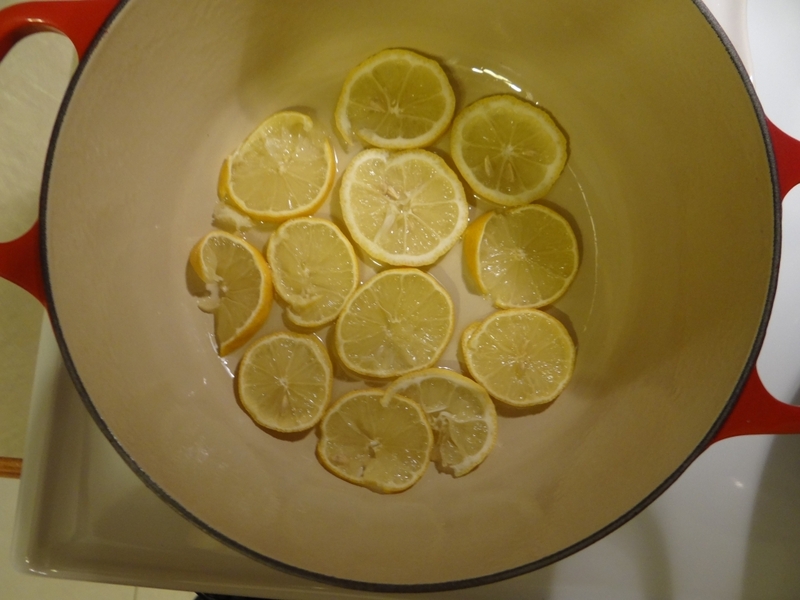 Next, layer the bottom of your pan with sliced lemons. One or two lemons will do it. UPDATE: Many people are finding this too lemony. I suggest now using thin slices and sticking to half to one lemon. From there, it goes in the oven and roasts. One thing I noted was that the green beans got quite roasted. I like that, but if you don’t want your green beans crunchy, put the chicken on top. If you like barely cooked green beans, add them later in the process. The final result is a quite juicy and very healthy roasted chicken meal. All in one pot and all in around an hour. UPDATE: A few people have had issues with the potatoes getting fully cooked. I have never had that problem using baby reds cut in half in my Le Creuset. If using an alternate baking dish, you might need a bit longer. UPDATE TWO: One reader had very good results baking this at 350 for 2 hours. I do like the idea of longer at a lower temp. 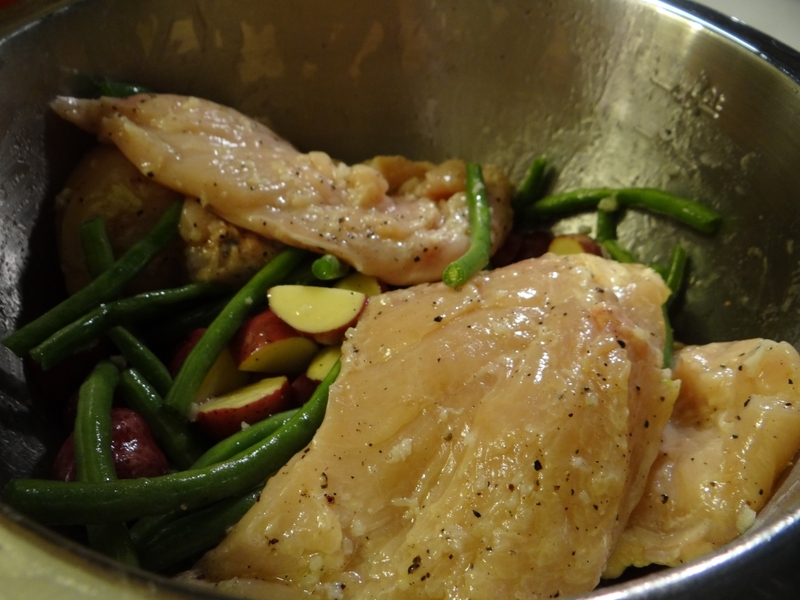 Add the chicken, green beans and potatoes and toss to coat. Could this be done in a slow cooker? how long would you cook it for? I tried this recipe but I don’t think I would cook it again. The chicken was really good but the potatoes and green beans were not. The Green beans were horrible! I think it would be a great recipe just using chicken. It also took a lot longer than 50 mins for the potatoes to cook. This cooked well and was very juicy; however it was overwhelmingly lemony. I would take the lemon slices out of the bottom because it makes the whole dish bitter and difficult to eat. I’m an onion fan too. Will have to try this again with it added! Thanks! I added your information to an update in the post. In fact, I’ll try remaking it that way myself! Did u put the lid on your DO? Yes, I used the lid. I made this last night and I followed everything you said to do (no updated steps) and it came out perfect!!! Loved it!!! Not too “lemony” and the chicken was very juicy… THANX! Has anyone tried asparagus instead of green beans?